Author: Valentin Vydrine. Series edited by: Raimund Kastenholz. Within Mande Kagoro belongs to the western branch of the Manding language group. 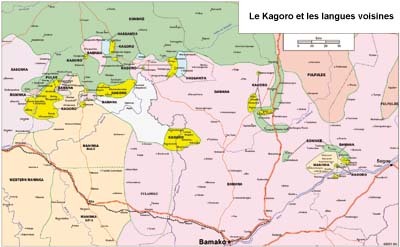 The Kagoro live in Mali north of the Niger, from Mogola in the east to Séféto in the west. Although about 30,000 people consider themselves as Kagoro, only half of them speak the language. The socio-linguistic situation varies between the seven dialectal zones, but is alltogether precarious, as in many villages Kagoro is on the verge of extinction. Generally only the older generation still retains their command of that language, whereas younger people have at most passive knowledge. The Kagoro are almost exclusively bilingual, with a shift to the closely related Bambara becoming more and more discernable. The author considers his sketch only as a preliminary description of Kagoro. Special emphasis is placed on the analysis of the phonological system, with a separate chapter dedicated to tonology. A short description of the morpho-syntactic characteristics closes the main part of the analysis. The extensive data of the dialectological survey was gathered in the course of 1999. It is presented as a detailed comparative wordlist, in which lexemes from the seven dialects of Kagoro and their correspondences in Bambara and Khassonka are contrasted. The appendix consists of three fairy tales with interlinear and free translations and a Kagoro-French vocabulary. First of all is the question of what is Kagoro? Clearly it is a recognized entity, given that there is an organization, called the Assemblée Kagoro consisting of delegates from 70 of the 88 Kagoro towns that the author identified based on two questions: (1) what are the language(s) spoken in your town; and (2) what are the language(s) spoken in the surrounding towns? The problem arises when we ask what is it that unites the Kagoro people? First of all they are not united by a common territory, being distributed as islands in a Mande sea. Second they do not share a common language as Vydrine points out that there are both “soninkaphone” and “mandingaphone” Kagoro. Furthermore, the Manding dialect of the Maninka-Bagué of South Kaarta is “almost identical” (27) to that of the local Kagoro, whose villages cohabit the area. Third, the Kagoro do not share a common oral history, even though, the difference between the Manding and the Kagoro is generally seen in terms of different origins. 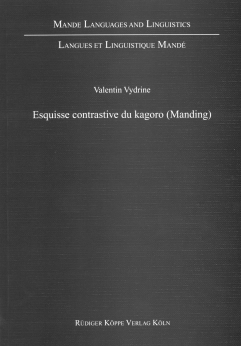 Vydrine concludes the history section with the view that the various histories that he has collected along with those previously published “leaves the impression in each version of a different group: no common point, no historic personages were mentioned by more than one author other than Soundiata, Soumangourou and N’Daman Guillé who are figures external to Kagoro history” (23). It is of course possible that the Kagoro share some common cultural traditions, though nothing is said of this in the present volume and apparently not in other published volumes on the same topic. [...] And although Vyndrine [sic!] frequently apologizes for the brevity of his fieldwork, what he has collected and presented during his ten-day expedition is remarkable. And despite the caveats offered by the author, this work will prove extremely useful to Mande comparativists, as will the two very interesting questions which he has brought to our attention and which deserve further and more exhaustive exploration.